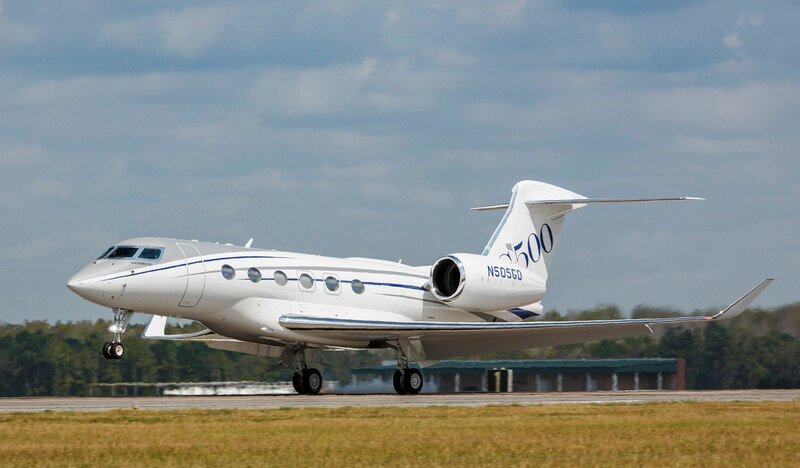 The G500 maintains Gulfstream’s signature style, from the clean cabin design to the large oval cabin windows to the slick wing with an aggressive 36-degree sweep. The large-cabin business jet experience is about to be redefined, thanks to Gulfstream Aerospace’s G500. The approximately $45 million large-cabin, long-range jet—which the airframer now expects to begin ­delivering to customers by late 2017—has a maximum speed of Mach 0.925. 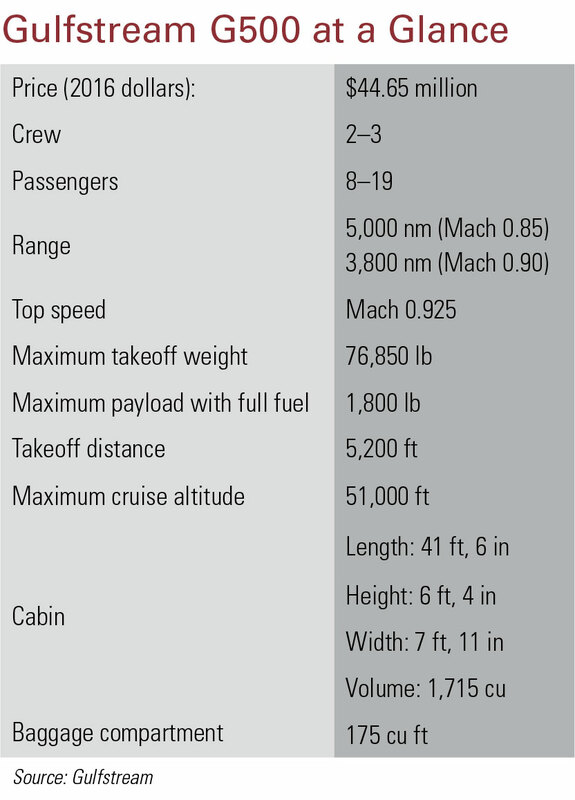 It has a range of 5,000 nautical miles at Mach 0.85 and can be configured to convey up to 19 passengers in a three-zone cabin. The aircraft features Gulfstream’s Symmetry flight deck, which is driven by Honeywell Primus Epic avionics and characterized by clean lines and an absence of much visible switchology. The avionics include Gulfstream’s enhanced vision, Honeywell’s synthetic vision with 3-D taxi, and a head-up display system. Pilot inputs are made through five Honeywell touchscreens with large, easily viewed icons. Gulfstream’s familiar cursor-control devices (CCD) are integrated into the center console at the head of the handgrips. The console extends aft of the pilot seats, but it is lower-slung, making step-over entry and exit easier. The CCD gives each pilot control of three of the four main display screens and allows data to be shifted between them in the event of a failure. Out the windshield and over the nose, visibility is expansive. The gaspers are large and located to provide optimum ventilation. The new-design Ipeco crew seats have multiple adjustments. The elbow rests behind the sidesticks are adjustable, as are the rudder pedals. The sidewalls offer ample ­storage space for personal items. Two 110-volt power outlets are located aft of the pilot seats. The Longitude must offer a superior value proposition, which means it will be competing largely on price. In development for seven years, the G500 is slated to replace the G450 in Gulfstream’s product lineup and shares considerable proven designs and systems with the airframer’s wildly successful ultra-long-range, large-cabin G650. Equipment and systems in common with those on the G650 include air data and secondary power; primary avionics content; auxiliary power unit; cabin acoustic treatment; satellite, navigation, and radio communications; the wireless Gulfstream Cabin Management System; and hydraulic and electric power generation. The fly-by-wire flight controls and actuation, cabin pressurization and control, landing-gear control, and aircraft health and trend monitoring system all employ architecture and design similar to what you’ll find on the G650. The G500 also shares the G650’s expansive cabin windows and emergency exits and has a similarly styled electric main entry door. In a recently announced minor change, the G500 has 14 main cabin windows, up from an originally envisioned 12. The G500 maintains Gulfstream’s signature style, from the clean cabin design to the large oval cabin windows to the slick wing with an aggressive 36-degree sweep. 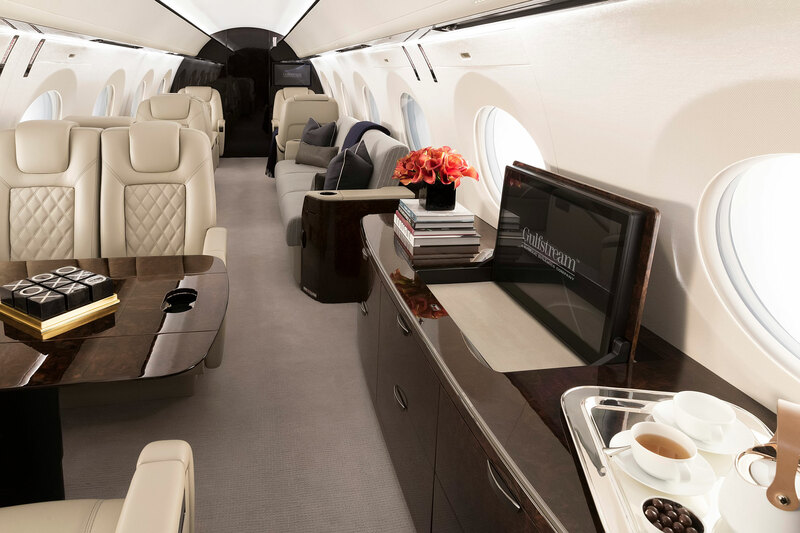 The cabin cross section measures 91 inches wide and 74 inches tall—about seven inches wider and two inches taller than the cabin cross section in the G450. New cabin seats have controls in the inboard armrests and pockets sculpted into the interior arms for more hip room. The aircraft features forward and aft lavatories and a roomy 175-cubic-foot baggage compartment that is accessible in flight through the aft lavatory. Additional floor and ceiling tracking allows for flexible loading and incorporates fold-down shelving and space that can be configured to store golf clubs, ski gear, or large suitcases. The G500 can be configured with a forward or aft galley that allows for a high degree of customization. The galley offers a four-cubic-foot refrigerator, a microwave/convection oven, and an oversized sink. A steam oven is optional. 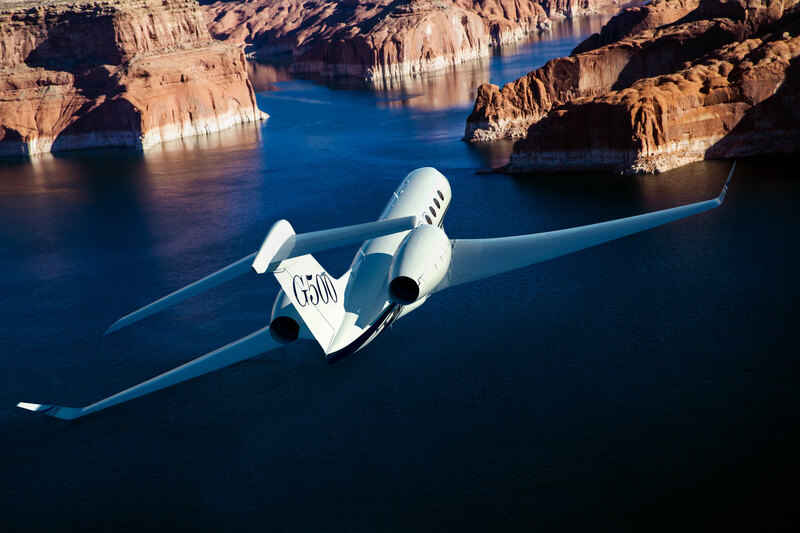 Gulfstream designed the G500 with simplicity in mind. The flight controls need just eight line-replaceable units as opposed to 16 on the G650. In addition, major inspections will be at 750-flight-hour intervals and are designed to be conducted along the less-cumbersome lines of the airline-style MSG-3 program. The G500 is also the first business aircraft manufactured with a Data Concentration Network (DCN), which significantly reduces cables, parts, and weight. Power for the aircraft comes from Pratt & Whitney Canada’s recently certified PW814GA engines, which provide 15,144 pounds of thrust each. The engines have the same core technology used in the company’s geared turbofan airliner engines. They have a 10,000-hour time-between-overhaul limit and no midlife-inspection requirement. The G500’s focus on passenger comfort and ease and economy of operation should make it a class leader when it reaches the market. Through late October, the G500 test fleet had flown over 1,750 hours, achieving a top speed of Mach 0.995—just barely under the sound barrier. It has flown at up to 53,000 feet, successfully crossing the Atlantic, and logging a longest flight of nearly eight and a half hours. It has smartly survived a variety of ground-based extreme temperature chamber and crosswind torture tests at Eglin Air Force Base in Florida. Besides flying four certification test aircraft and one production evaluation aircraft, Gulfstream has conducted over 53,000 hours of testing in the systems integration bench, integration test facility, and “iron bird” test fixture. Human-factors testing has been completed with the FAA and its European equivalent, EASA, in the integration test facility and a FlightSafety International cockpit simulator. Among the human-factors tests was one that validated the pilots’ ability to use the G500’s touchscreen avionics in turbulence. FlightSafety had a G500 full-motion simulator up and running at its Savannah Learning Center before the aircraft made its first flight. It’s fully conformed to the G500’s flight deck and features new Vital 1000 high-resolution graphics. Gulfstream used it to develop flight-crew procedures for the G500 and to support crew training, familiarization, and human-factors testing.